I have a bit of a ritual I stick to during these colder months. It involves cozying up in my reading chair on Sunday afternoons, doing some reading, and enjoying two glasses of beer. I’ve been doing it for years, and I love it. But according to a new Chinese study, I might want to increase the frequency! A study looking at 80,000 healthy Chinese adults found that moderate alcohol consumption was associated with slower HDL (good cholesterol) declines over time. HDL cholesterol is a good marker of overall health, and higher levels of it can lower your risk of heart attack and other cardiovascular illnesses. Researchers monitored alcohol consumption for over six years for the community-based study, relying on self-reporting about alcohol consumption habits. Now, normally, I’m iffy on self-reporting, especially when it involves something where guilt or societal judgment takes place, but these results are impressive regardless; the reason being that people would be more likely to under-report booze consumption. Participants were asked whether they were non- drinkers, light drinkers (one or fewer drinks per day), moderate drinkers (one to two drinks per day), or heavy drinkers (more than two drinks per day). The researchers found that HDL levels dropped in every group (which is a normal part of aging), but that those who were moderate drinkers experienced the slowest decline. For men, this meant drinking a maximum of two drinks per day, and for women, it meant one. They also looked at the type of alcohol people were consuming, and it turned out that HDL levels lowered most slowly among moderate beer drinkers. Light drinkers who opted for hard liquor as their drink of choice saw levels decline slower than moderate or heavy consumers of the strong stuff; not enough of their sample size drank wine to make an accurate projection. However, considering what we already know about the health benefits of moderate wine drinking, I think it’s fair to say it may have comparable benefits to beer. The key to all of this data, of course, is the emphasis on moderation. 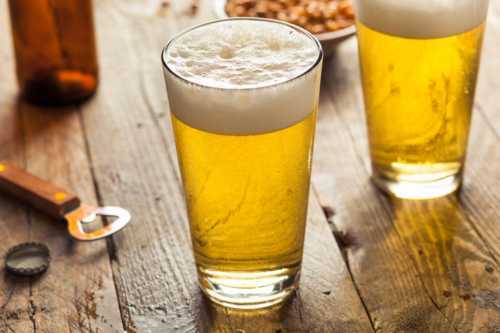 One to two drinks per day is considered moderate, and saving them all for one day certainly isn’t the same thing—if I were to sit down with 14 beers on a Sunday, I’d be doing some serious health damage. But this new research does make my weekly ritual something I should consider doing a little more often. Also read: Alcohol and Blood Pressure: What Are the Effects? American Heart Association, “Moderate alcohol intake may slow good cholesterol’s decline,” Science Daily, November 14, 2016; https://www.sciencedaily.com/releases/2016/11/161114110110.htm, last accessed November 22, 2016.